What on earth is chicken katsu kiev I hear you cry. Well, chicken katsu is one of our favourite dishes from Yo Sushi. It is simply crumbed chicken goujons with a Japanese curry sauce, which is extremely moreish. I wanted to make a version of chicken kiev, but something different to the classic. The chicken katsu kiev was born. They are quite tricky to make, but a few foolproof tips will help you turn these out successfully. Make the curry sauce first by softening the onion for 5 minutes in some oil. Add the curry powder and garlic cook for a further 3minutes. Add the chicken stock, mirin and soy sauce and cook for 5 minutes. Blend with a stick blender. Freeze in large cubes or balls if possible. Butterfly the chicken breasts, put cling film below and on top of the chicken. Carefully flatten as much as you can with a rolling pin or mallet. Remove the top layer of cling film. Add a ball of the frozen curry sauce. Bring the chicken up and around it. Using the cling film that was on the bottom, wrap this and tighten as much as possible to squeeze the chicken together. Place in the freezer for at least one hour. When ready to cook, coat the kievs in flour, egg and breadcrumbs. Deep fry at 130°c until they lightly brown. Drain on kitchen paper. Transfer to the oven at 180°c for 15 minutes. For the spinach curry. Cook the shallot, spices and garlic for 2 minutes. Add the squash cubes and a splash of water. Cook for about 8 minutes until the squash is cooked. Add the spinach at the end and let it wilt down. Serve the curry on the bottom of a plate, top with some boiled sushi rice and top with the kiev. When I visited there I asked if they ate chicken and my friend said, “we just call it chicken”. He hasn’t eaten anything that looks this good! I never thought of that Maureen, quite apt really. It does originate from there. Interestingly it was the first ready meal introduced in the UK in 1976! That is one fancy looking chicken kiev. I love chicken tonkatsu and I love curry so I know I would love this dish. I think chicken tonkatsu is easier to prepare the next time though. Your tips are perfect and I can see how this would work out perfectly. I love that you froze the curry in balls to make it easier to wrap the chicken cutlets around it. I’m not much of a fried food eater but this would be worth the splurge on for sure. I love all the flavours of the curry as well. Nicely done David. I try to stay away from the fryer, I only bought it to cook chips! On this occasion there was no way of shallow frying it in a pan unfortunately. The balsamic pearls came out a treat btw. I’m so glad David, thanks for letting me know. I remember eating a lot chicken kiev back in London in the 80’s! Now in the US, I hardly come across it. I do like it though and you’ve kicked it up a notch with curry sauce! 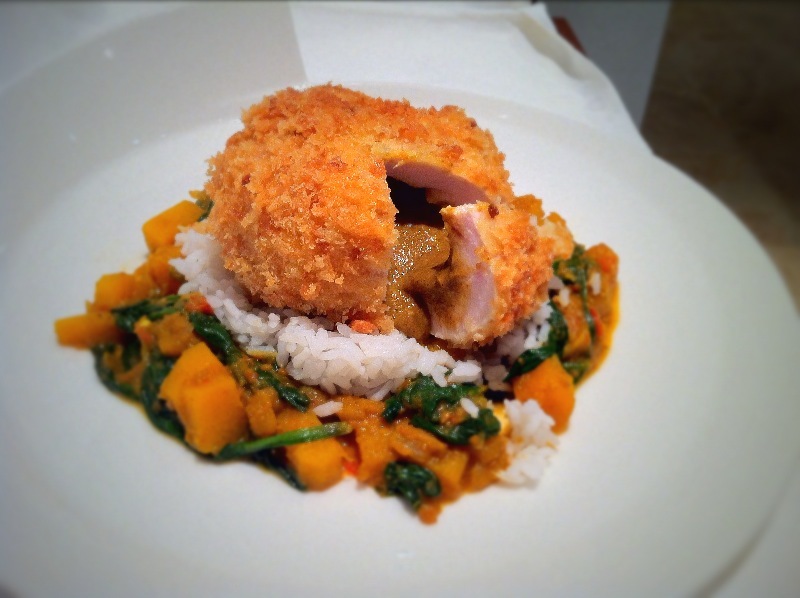 Love your presentation of this Chicken katsu kiev – the combo of curry and baked breaded chicken is so unique to me! You haven’t lived Shashi if you haven’t tried this. If you don’t want the breaded fried/baked chicken, the curry sauce with grilled chicken is a must. Even kids eat it.